Main: How do you get to the Carnegie Hall? Today we celebrate the opening of Andrew Carnegie’s Music Hall in New York — now simply known as The Carnegie Hall — on this day in 1891. 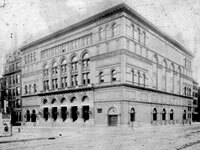 Built at 881 Seventh Avenue, at the edge of Goat Hill, a short distance from Central Park, the Hall soon dropped the “Music Hall” name as it conveyed the wrong impression to Victorian society — for here was a premium venue for classical music. The opening programme on May 5, 1891, was the first night of a 5‐day opening festival under the baton of Walter Damrosch and no less a figure than Pyotr Ilyich Tchaikovsky. Following the playing of “America”, Opening Night began with Beethoven’s Leonore Overture No 3, conducted by Damrosch. Tchaikovsky then stepped up to the podium and conducted his Festival Coronation March, before Damrosch concluded the evening with a performance of the Te Deum by Hector Berlioz. Today we’ll hear the classical works that featured in that opening night programme, along with other works by Beethoven, Tchaikovsky and Berlioz. And the answer to “How do you get to the Carnegie Hall”? “Practice, practice, practice!” of course! Then join us at 11am and 7pm Pacific, 19:00 and 03:00 in the UK, for the latest installments in our exciting radio adventures from ZBS Foundation. We kick off with Part 3 of Jack Flanders’ Amazing Voyage to The White Castle and in the second part of the hour, we conclude our mysterious 2‐part adventure, The Insider Lounge.